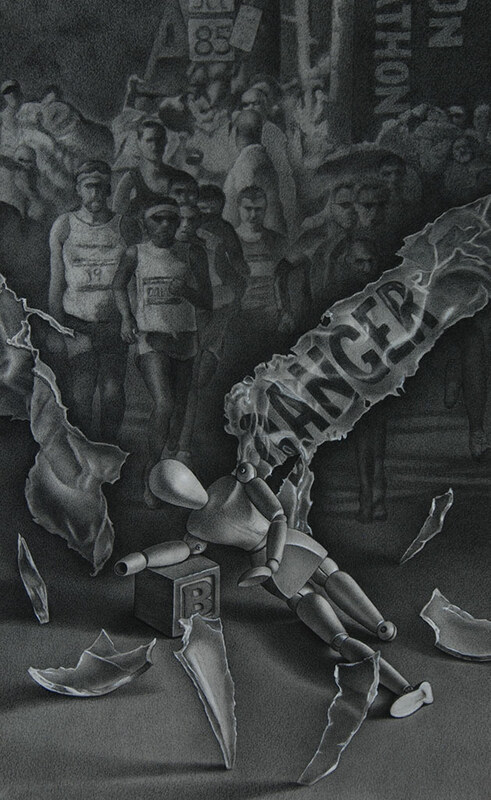 This piece is an homage to the bombing of the Boston Marathon. I felt that using a realistic figure would be too graphic so I decided to use a mannequin, which coincidentally already had a leg and arm missing. I took police tape and then melted and warped it to show the word "danger" as "anger". I then broke bottles and inserted the shards of glass into my set up to show the horror of the incident. I drew the background from an assortment of photos I found from the news of that day. This piece was done in conté and white pastel. It is 13" x 22".